A new TPO roofing system aims to cut down on the cost and bother of cleaning the roof surface after installation by providing a protective film that can be peeled away at the finish of the job. 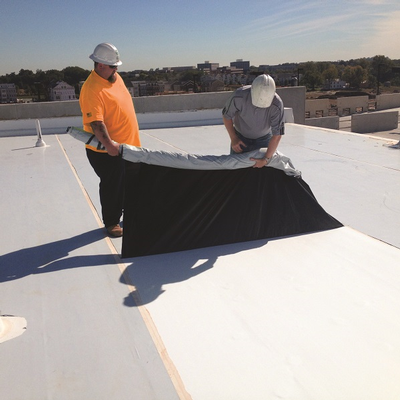 Mule-Hide TPO with CLEAN Film, from Mule-Hide Products (Beloit, WI), is touted as a thermoplastic olefin system that does not need to be washed down once installation is complete. The "CLEAN Film" technology is a gray film layer on top of the TPO surface that can be left in place, protecting the surface during construction, according to the company. “Stress-free, splinter-free removal” is ensured within 90 days after installation. The film will stay in place through any weather while the job is being completed, the company says, noting that “stress-free, splinter-free removal” is ensured within 90 days after installation. The film comes in 5-foot-wide sheets, according to product details. Mule-Hide suggests using the product in applications where water is not available onsite or conservation measures make washing the TPO surface impossible.